PCMechanic is a computerized maintenance management system (CMMS), also known as a computerized maintenance management information system (CMMS). It is an online software solution that maintains a database of information about an organization's maintenance, service, and inventory operations. PCMechanic can be utilized to track any asset type, from forklifts, dock levelers, exhaust fans and batteries, to delivery trucks and transportation fleets. Manage the service and repairs for your fleet and equipment regardless of the size of the fleet, or size of the asset. 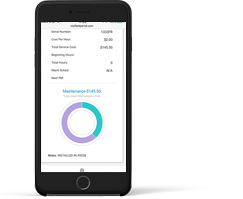 Add, report, edit and export your service entries, maintenance and asset inventory from any device with the cloud based, PCMechanic application. If you have internet access, you can access your data.. Maintenance workers and maintenance supervisors spend most of their time outside the office servicing and managing assets. So making the CMMS available in the field on their mobile device is essential. Pcmechanic is built with the service techs and asset managers in mind. Track your fleet for trends in repairs such as abuse or breakdowns, and evaluate the assets cost per hour. Identifying equipment that is nearing its lifespan is important for asset allocation within your facilites. PCMechanic can eliminate the costly paperwork associated with asset maintenance. Keep a full history of all service performed on all your assets. Meet warranty requirements with regular, recorded, preventive maintenance on all your assets. If it has been entered, it can be reported on. 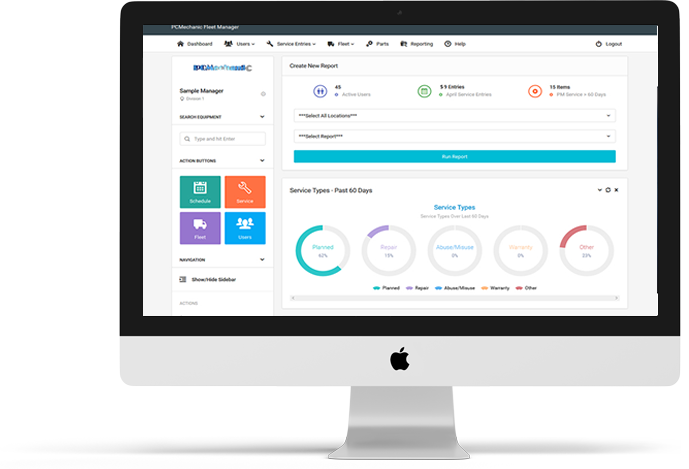 PCMechanic makes reporting on your assets service a breeze. Run any of the pre-made reports, or create and save your own. If you have unique requirements for specific reporting, just ask, and a custom report will be created at no cost. PCMechanic can manage all your assets. It is all just data. Need to manage maintenance on a cooling unit or a pump? How about changing water on all your assets batteries? Schedule the PM and enter the service individually, or in bulk. Normal wear and tear can result in lower machine efficiency. Preventive maintenance assures optimal working conditions and conserves the life span of the equipment. A planned preventive maintenance program may cause small hindrance for production, but that is nothing compared to actual downtime caused by a breakdown. Simply put, cloud computing is computing based on the internet. There is no setup, no waiting for upgrades, full 24/7 access and flexiblility with how you access your data. Without the need to have special equipment or maintenance, your long, and short term costs are lowered and much more affordable. PCMechanic can manage your assets from one single location, multiple locations (Branch Plan) or for your entire enterprise. Expand the usage as you go. 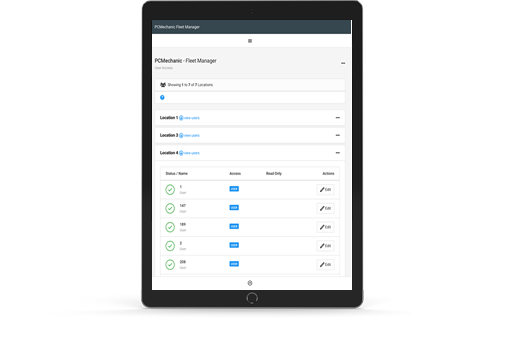 Create managers to oversee multiple locations while segregating the data between divisions. Allow administrators to view, report and access data from all divisions with one login. Pick the best plan that meets your business needs. We are more than happy to provide you access to the Demo site to help with your decision process..
Is it difficult to add additional locations? No, in most cases a new location can be added within minutes of your request. If needed, we will import all assets into the new location within 24 hours. This is a big time saver for getting up and running quickly. Enterprise users can add locations and branches at any time. If you do not decide to purchase the same or upgrade to a new plan, your account will expire. You can recover it by buying any of the offered plans. All data from your account will remain intact for 6 months. What if I have special or specific information needs? Tell us what they are. In most cases your needs are already built into PCMechanic, in others, we are more than happy to make specific modifications for your organization, at no cost to you. Of course there are exceptions, but in most cases we will try and accomodate all your needs. Is the Enterprise plan expensive? No, in fact it can be the most affordable. If you manage a large organization with many different divisions or facilities, this is exactly the right plan. It allows you to setup segregated data for each location and division, with users having limited access to only their specific location or branch. Yes, you can. Our plans are month-to-month. You are free to cancel the selected plan anytime you wish. Once you decide to cancel the current plan, we will not charge you for the next period. As soon as you decide what other plan to opt for, we will contact you for verification. Can we resell to our customers? Yes, this is very common for service companies to offer PCMechanic to their customers as an add-on to their service offerings. Others include it within their standard service packages allowing their customers access to all their assets service. If you are in doubt of which plan to opt for, give us a call. We understand that a CMMS only works if the users are willing to use it. If you have any questions, just fill in the contact form or give us a call. Thank you for your request. We will respond back shortly. PCMechanic provides reliable, affordable fleet and asset solutions.